After reading various woodworking blogs I've noticed that it's de rigeur for woodworkers to have shop dogs on the premises. That inspired this post about our own shop dog, named Linus. Linus is a high energy English Springer Spaniel, which is another way of saying he's the black and white equivalent to Tigger. Despite his relentless nature Linus is also extremely patient and well mannered, which makes him an excellent therapy dog. When not doing therapy work Linus loves to hang out at our shop, working part time as a greeter and exterior property manager. For Linus the favorite part of his day is running laps around the front of the property, chasing anything that catches his fancy. 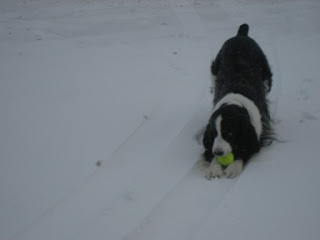 If you ever want to see a Springer Missile in action, just throw a tennis ball as far as you can. You can count on Linus to park himself in the center of the action. Thankfully he works cheap. A little attention and the occasional slice of cheese is all it takes to keep Linus a happy puppy.